The Great Artesian Basin (GAB) is Australia’s largest groundwater basin. It contains about 65 million gigalitres (GL) of water and underlies more than 1.7 million square kilometres of eastern Australia. The GAB extends beneath parts of Queensland, New South Wales, South Australia and the Northern Territory and is one of the largest natural underground water reservoirs in the world. The GAB underlies a large portion of the Murray–Darling Basin (MDB) in northern NSW and southern Queensland, as depicted in the figure below. It consists of layers of aquifers and aquitards ranging from 65 to 250 million years old, deposited in the Triassic, Jurassic and Cretaceous periods. These depositional basins include the Surat Basin, Eromanga Basin, Carpentaria Basin and a portion of the Clarence Moreton Basin. The boundaries between these depositional basins are defined by geological structures, such as ridges and major faults in the sub‐surface. The GAB also overlies older geological basins, such as the Bowen Basin. These basins are deeper than the GAB and, in the case of the Bowen Basin, have a boundary that extends beyond the boundary of the GAB. The Bowen Basin contains older, deeper coal seams and the Fairview and Scotia gas fields. The primary target of coal seam gas (CSG) production are coal seams contained within specific GAB rock layers laid down in the Jurassic period. In the Surat and Clarence Moreton Basins, these coal seams are referred to as the Walloon Coal Measures. Within the Walloon Coal Measures, CSG is trapped by groundwater pressure. CSG extraction occurs by drilling into the coal seam and lowering the groundwater pressure. Groundwater resources in the GAB and Bowen Basin support an extensive pastoral industry, inland population centres, mining activities, and other industries. There are many resources present in the basins – water, gas, oil and geothermal energy – and demand for these resources is increasing. From the perspective of the whole GAB, water from rain and some rivers enters the groundwater along the elevated margins. From these areas of recharge, groundwater is driven by topographic gradient to lower‐ lying parts of the landscape where it can discharge back to the ground surface. In the GAB, groundwater discharge occurs through springs, artesian bores, extraction bores and very slowly by a diffuse seepage process across broad sections of arid land. the GAB, the Jurassic and Cretaceous beds that form aquifers are confined by nearly impervious rock layers. These confining beds and relative elevation difference with the more elevated recharge areas results in the artesian groundwater pressure. A schematic slice representation of groundwater flow through the GAB is illustrated in the figure below. Since the 1880s, groundwater pressure has declined due largely to uncontrolled bores and open bore drains. Rehabilitating (capping) artesian bores and upgrading them with closed pipe systems was the focus of the GAB Sustainability Initiative (GABSI), which commenced in 1999. Schematic slice through the Great Artesian Basin illustrating predominant aquifers in the Jurassic and Cretaceous beds in blue, confining layers in grey, and other aquifers in orange. The slice represents schematic layering from major spring zones in South Australia (left side of figure) to major recharge areas in Queensland (right side of figure0 and therefore the vertical scale is exaggerated (Source: Radke et al., Hydrochemistry and implied hydrodynamics of the Cadna-owie – Hooray Aquifer, 2000). What is the connection between the MDB and GAB? The MDB and GAB are connected by the upward groundwater pressures exerted by the GAB in central and western NSW and Queensland, and leakage from rivers and alluvial sediments of the MDB to the GAB where Jurassic and Cretaceous beds are exposed along the western slopes of the Great Dividing Range. 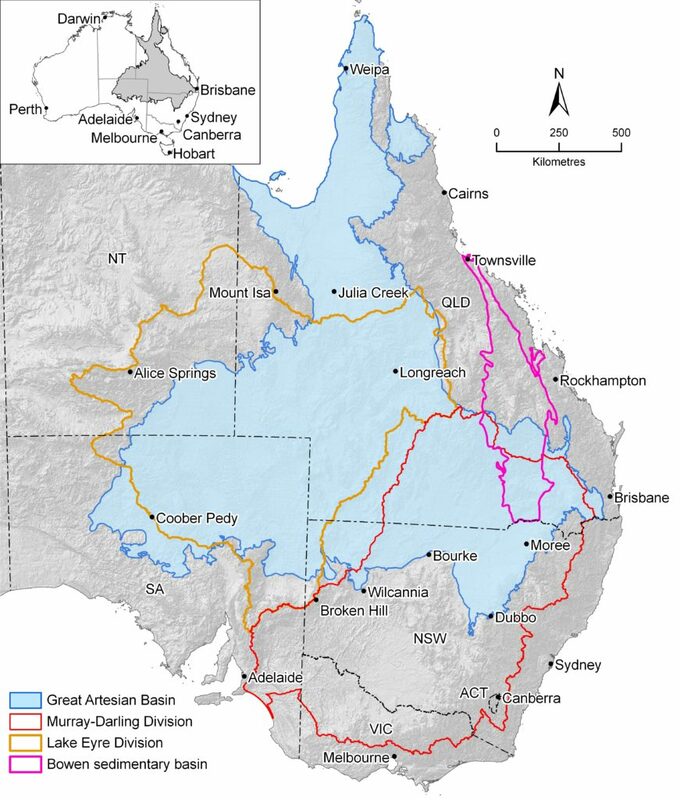 Areas where rivers are known to cross GAB aquifers include the Macquarie‐Castlereagh region of NSW, Border Rivers region of NSW and Queensland, and the Condamine‐Balonne region of Queensland. The connection between MDB rivers and alluvial aquifers and the underlying GAB is complex and spatially variable. While some rivers are known to gain or lose water with GAB aquifers, in some locations this connection is restricted. Where connection with GAB aquifers is restricted, MDB rivers may gain or lose water with alluvial aquifers. Many of the GAB aquifers, particularly the Cadna‐Owie Formation–Hooray Sandstone aquifers, have been the subject of many investigations and groundwater flow is generally well understood. Yet, information on the layering of confining beds is sparse. The thickness and structure of confining beds will govern the extent to which vertical flow from one aquifer to another is impeded. As part of monitoring CSG sites, the extent to which coal seams are connected to aquifers, and the extent and thickness of confining layers can be mapped. When combined with measurement of groundwater pressure, hydrodynamic assessment can be completed to map the rate and direction of groundwater movement and the connectivity of aquifers in the sub‐surface. CSIRO has led work on an integrated re‐appraisal of the latest hydrogeology and hydrochemistry of the entire GAB to better understand how the whole groundwater system operates. The re‐appraisal builds on the approach taken by CSIRO and partners in the Murray‐Darling Basin, South‐West Western Australia, Northern Australia, and Tasmania Sustainable Yields projects. The assessment was completed in March 2013 and is available on the CSIRO website. The Great Artesian Basin (GAB) is composed of a sequence of sediments that form aquifers and confining layers (aquitards). The thickness and lateral extent of sediments that have formed the aquifers and aquitards depends on conditions at the time of sediment deposition, which ranges from 65 to 250 million years ago, and all the geological forces that have occurred since. It is challenging to visualise the exact nature of these sedimentary rocks. Just as the study of geology attempts to unravel the history and understand the nature and structure of geological rock systems from the deep subsurface to what is exposed at the surface, the study of hydrogeology focuses on movement of fluids through these complex geological features. Groundwater in the GAB is mostly under artesian pressure, which is a result of confining layers preventing movement of groundwater up to the ground surface. The extent of artesian conditions across significant portions of the GAB is evidence of extensive and relatively tight confining layers at a broad scale. Extraction of groundwater from aquifers will lead to a change in pressure conditions around the location of extraction. For instance, widespread drilling of artesian bores in the late 1800s led to decline in the artesian pressure of some GAB aquifers. Because aquifers readily transmit groundwater horizontally along the depositional layering, the pressure change associated with extraction will propagate more easily through aquifers horizontally than vertically through aquitards. When several layers of aquifers and aquitards are present, pressure changes caused by groundwater extraction will propagate at various rates in various directions, depending on the physical properties unique to each aquifer and aquitard layer. Groundwater movement through aquitards is very slow, and the response to pumping in an overlying or underlying aquifer will be slower compared with that within the aquifer. Generally, this concept is referred to as a leaky aquifer response. Because the science of hydrogeology is based on finding water resources, from aquifers, the study of aquitards is less frequent. Likewise, pressure conditions in aquitards are often not part of usual groundwater monitoring programs. Groundwater movement through aquitards is often analysed using computer models, by which the age of the water contained within the pores of the confining layers can be estimated. Relative to aquifers, changes in aquitards from pumping could take a very long time to detect. The extraction of coal seam gas (CSG) can potentially impact groundwater, depending on the location and method used for extraction. CSG is adsorbed into the coal matrix and is held in place by the pressure of surrounding formation water. To extract the gas, a well is drilled into the coal seam and formation water from naturally occurring fractures (cleats) is pumped and withdrawn. The removal of water in the coal seam reduces the pressure, enabling the CSG to be released (desorbed) from the coal micropores and cleats, and allowing the gas and produced water to be carried to the surface through the wellbore. Groundwater modelling is undertaken to predict the extent to which coal seams are connected to aquifers, and whether drawing water from one will impact levels in the other, and over what timescale. Seismic mapping technologies are also used to map fracture locations and channels for water movement underground. The movement of naturally occurring or introduced chemicals (such as those used for CSG extraction) in groundwater depends on the physical properties of the aquifer or aquitard and the properties of the chemical. Some chemicals dissolve very easily in water and move at nearly the same rate as groundwater. Other chemicals tend to attach to sediments or undergo degradation reactions and move much more slowly than the groundwater. Groundwater: water that occurs within the zone of saturation beneath the Earth’s surface. Geological units can be defined based on their ability to store and transmit water. Formation water: another term for groundwater that occurs within the pores of rock. Formation water might not have been the water present when the rock originally formed. In contrast, connate water is the water trapped in the pores of a rock during its formation, and may be called fossil water. Water from fluids introduced to a formation through drilling or other interference, such as mud, does not constitute formation water. of unconsolidated sand and (or) gravel deposits, consolidated deposits that are permeable (e.g. sandstone and limestone), or consolidated formations that are generally less permeable (e.g. granitic and metamorphic rocks). An artesian aquifer has enough natural pressure to allow water in a well to rise to the ground surface without pumping. Aquitard: is a zone within the Earth that restricts the flow of groundwater from one aquifer to another. Aquitards comprise layers of either clay or non‐porous rock with low hydraulic conductivity or permeability.